Every city is a wonderful place with good food and nice people, once you get to know it. Bourdain can find pho anywhere. Seriously, he enjoyed a bowl every other episode, and none of those were shot in Vietnam. Really gave us a craving for the stuff, and I happened to be sitting on this recipe from America’s Test Kitchen. It’s not totally traditional. The cook made some major shortcuts with the goal of making this soup approachable for an average cook. It’s still time consuming and requires a fair few ingredients you may not already have in your kitchen. The lemongrass was my addition. And it wasn’t until I was nearly done with the soup that I realized there was no garlic whatsoever in the recipe. For a moment I thought I’d made a mistake and left it out. It isn’t really needed, this soup is delicious as is. Broth – a beef broth simmered with aromatics and spices, typically for hours. This recipe makes use of commercial broth and doctors it with more meat and seasonings. 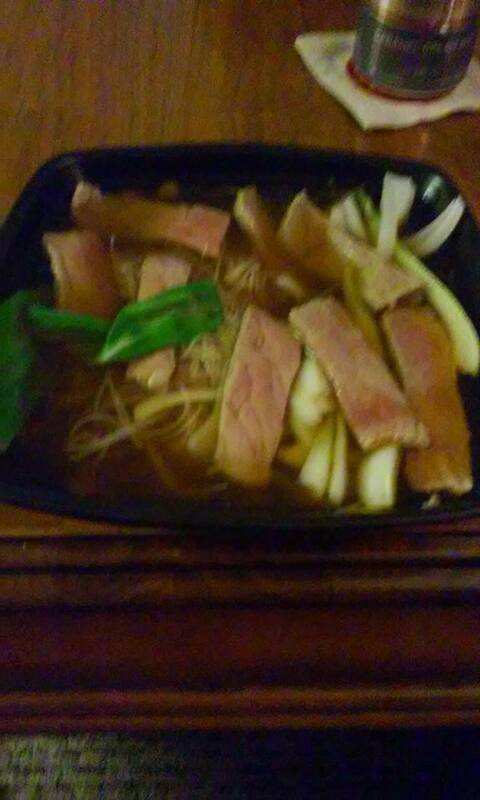 Meat – I used a steak, raw and sliced very thin, and let the heat of the finished broth cook it to a rare doneness. Variations include well done steak or tripe. There are others that escape me at the moment. Vegetables – again, varies. I used yellow onion and bok choy. Noodles – Thin rice noodles, typically found in Asian food stores or the Asian aisle of your grocery store. The broth is kept separate until serving, and for this reason can be made in advance. Strain out the water, return to pot. Cut the two onions into quarters. Set two of the quarters aside, add the remaining six to your saucepot. Peel the ginger and slice into thin rounds. Add these to the pot. Also add the broth, water, fish sauce, cinnamon, anise, cloves, sugar, salt, and peppercorns, return to boil on high heat. Reduce heat to med-low and let simmer for 45 minutes. This is a good time to prep the rest of your ingredients. Slice your remaining two onion quarters thin and set aside. The bok choy, I separated the white stalks from the green and sliced those. Cook your noodles according to package instructions, or cook in boiling water for a few minutes until they’re almost tender. For the steak, leave raw, slice about 1/8 inch thin. Once the broth is done simmering, strain through cheesecloth and return to pot. Discard all solids. Taste the broth and add salt and sugar to taste. You’ll want to overseason this a little bit, as the other ingredients in the soup will cut down on the salty taste. Bring the broth back up to a rolling boil. Ladle into each bowl and watch the steak cook before your eyes. And you’re ready to serve! Optional garnishes include cilantro, fish sauce, sriracha sauce, and scallions, but personally I don’t think they’re needed. Yes, this is a time consuming soup but soooooo worth it. « The Same Story, Except When it’s Not.